Hello lovely creatures on this snowy spring day! Perhaps you reside where the flowers are already springing up and the breezes are balmy and warm. We northerners need to wait a lot longer for such things to enjoy. Photo of our back yard taken yesterday, March 23rd. And before I get to the main point of this post, may I remind you - and for those who haven't seen it yet - of my ongoing 20% off coupon campaign for Clear Skin Minerals AND my Etsy shop. If you haven't read my previous post on that, you can find it here. You don't want to miss out on two life-time 20% coupons, do you? 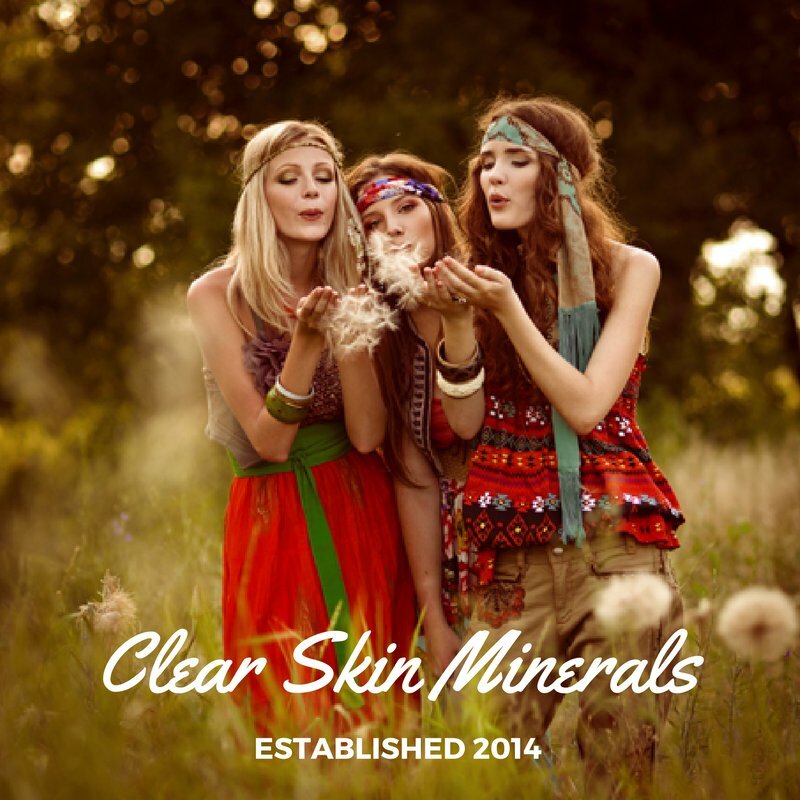 Check out the right sidebar of my blog and you'll see the Clear Skin Minerals graphic. Clicking on that graphic will bring you to Lisa's website and the opportunity to save 20%! But if you want another 20% life-time coupon to my shop, please read the particulars here. A month after Fanny was born, her parents noticed there was a problem with her eyes. Unable to find a competent doctor to help them, they found a man who said he was a physician. He put a hot poultice on Fanny's red and infected eyes, much to the concern of her parents. It did, indeed, cause great harm to her corneas and ultimately caused blindness, an unfortunate turn of events. Later that same year, her father became very ill and in a few days passed away, leaving her mother a widow at 21. They were already living together with Fanny's grandparents and other family members, and so her mother, Mercy, found work as a maidservant for a wealthy family to help support the family. This meant that Fanny's grandmother, Eunice, would be the one to take care of her. Eunice was determined that Fanny would have a good education and not succumb to being a poor, blind girl, dependent on others for help. Though blind, Fanny could see light and darkness and at times distinguish various hues. Because the family were believers in Christ - devout Puritans - Fanny was diligently taught from the scriptures, including the importance of prayer. Fanny was taught many other things, including botany, and later on at age 14, went to the New York Institute for the Blind. There's so much more to her life than I can recount here, and my main point of this post is to share the similarities we share. The LORD allowed her blindness to occur. Because of that, she excelled in many areas, namely in writing more than a thousand secular poems and around nine-thousand hymns! No claim to fame here - I have tinkered with writing poetry, prefer poetry that rhymes, and especially love the Dr. Seuss books! I am thankful for my vision and the ability to see God's creation - the wonders of the earth, animals, flowers, and the beautiful fabrics I use to create lovely accessories and clothing. Not to make light of Fanny's blindness - I am nearsighted, wear contacts, have an "Adie's Pupil" and am very sensitive to light, which means I even wear sunglasses in cloudy weather. The Adie's Pupil was diagnosed in my early twenties. It is slow to react to differences in light and is sometimes abnormally dilated. 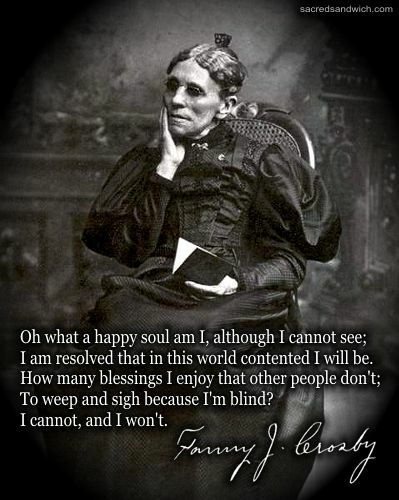 It's amazing to read that Fanny didn't mind being blind. She was very content! Fanny also excelled as a musician. 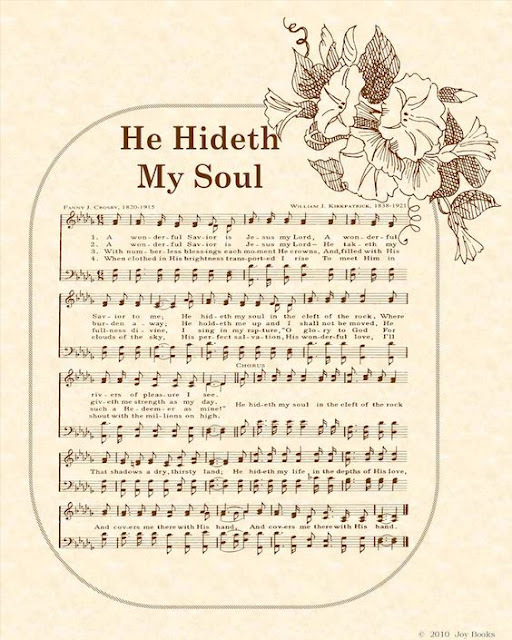 In addition to writing hymns and poetry, she was very skilled in playing the guitar, piano, organ, and the harp! She had trouble learning Braille and blames her inability to read Braille on playing the guitar. It does do a number on your fingertips! I did, for a very short time and a very long time ago, play the guitar - very basic chords. But then the guitar gathered dust in my closet and when missionary friends of ours were going to Fiji, that guitar went with them and found a new life in the Pacific! Music-wise, my similarities with Fanny now only extend to playing the piano and organ, but I have always had a life-time love of playing the harp someday. Mathematics was not Fanny's favorite - nor was it ever mine! In second grade, my teacher told me to stop counting on my fingers. Well, I still continued to do so, but not in the manner where she could tell. I'd have my hand resting on the desk and would press my fingers into the desktop one-by-one instead of holding them up in the air! And it's amazing that even though my "other-half" can add, subtract, and calculate percentages in his head, I'm the one who despises math, yet pays the bills, keeps track of the finances, and for a short time "did the books" for two Baptist churches here in Canada! But my claim to fame on finances only ends with adding up the incomes and expenses. Then I hand it over to our accountant at tax time! It has to be simple or else it gets stressful! Fanny's 95 years of life was so incredible. She was the "Queen of Hymns." 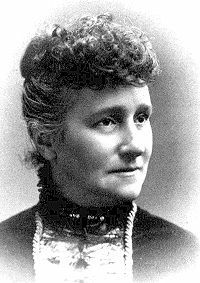 She lectured, spoke at churches, gave organ and harp concerts, was a prolific poet and hymn writer and a significant contributor to the success of D.L. Moody and Ira D. Sankey's evangelical campaigns. I highly recommend reading her biography. Happy Birthday to Fanny and Me! I share the same birth date with her - albeit 135 years later! I find that so awesome! have some chocolate cake with me! A cup of coffee or tea? It will be sure to please! So interesting to know who shares a birthday with you! Scrumptious chocolate cake and a cup of tea! :) We are entrenched in snow here to...but the sun is shining and spring is just a few weeks away! I do love historical stories... and Fanny’s life was quite remarkable ... and how interesting that you share the same birthday ... You were meant to tell her story... It is infact very inspirational , especially for children ... I do admire the preserverence of past generation to succeed in life. March is busy B’Day month for many people including our family ,who celebrate 4 out of 5...Today is my birthday and so THANK YOU I would love a cup of tea and piece of that delicious cake...Please do have a HAPPY EASTER !!! Thank you so much for your lovely comments - and happy birthday to you. Hope you had a great day yesterday. :-) How did you happen to find my blog, may I ask?